Kangaroo rats are small rodents that live in North America, and their name comes from the way they hop like a kangaroo, although they are not related. 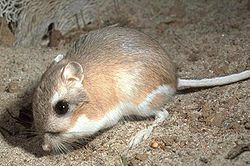 There are currently 19 kangaroo rat species and they have highly developed hind legs, live in deep burrows to protect them from the desert heat, and do not pee to help prevent dehydration. Kangaroo rats have a very water efficient metabolism which enables them to live in extremely dry habitats and have kidneys that are 4 times more efficient than human kidneys. Its a bit confusing, but there’s another animal called the rat kangaroo and is an Australian native. Kangaroo rats live in the deserts of the southwestern United States and Mexico. Rat kangaroos live in the swamps and deserts of northeastern Australia, and are smaller relatives of the kangaroo.